The one thing guaranteed to get people talking after a gig is the set list - were your favourite tracks done, how did they start and finish the set etc.? We thought it would be nice to try and put together a definitive collection of past Starsailor set lists, for reference, here on the site. The collection will be gathered and added to over time and I certainly need your help with it. I keep a record of gigs I attend, as do tour managers, but that's clearly not going to be everything. If you noted a set list to a gig you attended, please submit it for possible inclusion on the site. I've unfortunately had to remove the form that was on this page due to extensive abuse by spammers, so I need you to e-mail the information to me instead please. Please put the gig venue and that it's a set list in the subject line and I also need to know if you're going from memory, actually noted it as it went along, or preferably, have a physical set list to corroborate your listing. You can add additional information like support bands and anything you think pertinent too. Please see other set lists on the site for a feel for the format and information required. If you can type the songs in the same format as they appear here on the site, separated by slashes with a space either side ( / ) it will save me a task and would be very much appreciated please. 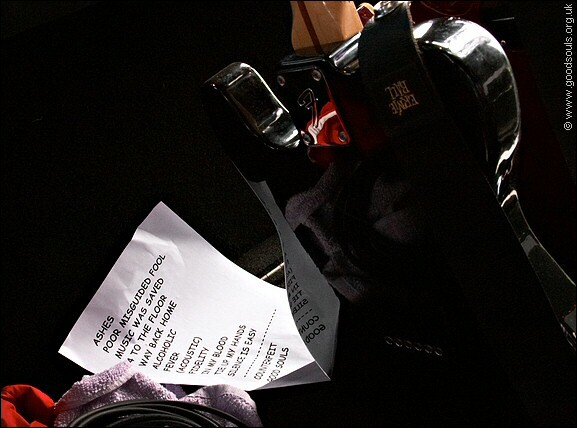 When the set lists are published, they will be graded for reliability depending on the way in which the information was recorded at the time. Published lists will be credited to the person(s) supplying them. Only set lists I feel are sufficiently reliable and detailed will be published. You can submit as many gigs as you like, but a separate e-mail for each one makes it easier for me to archive and find individual records, if that's possible please. * Please note: if you use a Verizon e-mail address and include it in any messages, you will not be able to receive any replies from me. Verizon block all mail sent from UK based IP addresses and I'm find this an increasing problem when I reply. All the messages I send to Verizon addresses are returned as undeliverable. Please use an alternative e-mail address in your message, if you require a reply from me.